Big Thank Yous to Jeffry's uncle Garry Denman who emailed me about this gem of a book. I just got it and am having a hard time putting it down! I was lucky enough to see Jeffry's wonderful turn as Munkustrap during CATS' last year on Broadway and well, he writes as well as he performs. This book started out as a journal, documenting what it was like to leave CATS and join the cast of The Producers. There's lots of great behind-the-scenes stuff, personal insights on the life of a stage actor and plenty of belly laughs too. Highly recommended! Stephen's personal experiences from audition to opening night of what was to become the longest-running Broadway show in history. If you've ever wanted to know what it was like to be a Real Jellicle Cat, this is the book for you! Another excellent behind-the-scenes look at life in the theater. The entire show plus exclusive behind-the-scenes footage, commentary by Andrew Lloyd Webber, Elaine Paige (Grizabella), and members of the original cast, and three original character concept drawings signed by creator John Napier. For those who don't have a DVD player, it's also available as a set of two VHS video tapes. & lots of great photos from the show and behind the scenes. 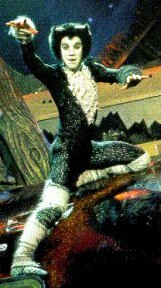 The story behind the creation of Cats plus sections on Phantom of the Opera, Joseph & the Amazing Technicolor Dreamcoat, Evita, Jesus Christ Superstar, Sunset Boulevard and more. TONS of photos! Search the Amazon.com catalog for more books on Cats... or anything else! All I Ask of You, Any Dream Will Do, The Music of the Night, 30 more. Gorey Details carries some wonderful rubber stamps, notecards, bookmarks and shirts with designs inspired by the man who illustrated the book that inspired CATS including some depicting the original Jellicles. They sell hundreds of dance videos to help you improve your dancing skills at home. Beginners through advanced level dancers can learn swing, salsa, jazz, ballroom, country, disco plus theater arts specialties. Lots of links to dance camps and competitions too.